The Commonwealth Aircraft Corporation was formed in 1936 to manufacture aircraft in Australia. The First General Manager of CAC was the noted engineer Lawrence Wackett whose influence over design was to be seen throughout his time at CAC. British manufacturers tried to discourage local Australian production and loss of their natural markets, but there was great outcry when the “colonial upstarts” selected an American design for production. Based on the North American Aviation NA-33, but modified to suit local requirements, the aircraft was named Wirraway, an Aboriginal word meaning challenge, and this was appropriate for at that time Australia was not even able to fully manufacture motor cars. CAC produced not only the airframe but the engine, while industry provided support with equipment and fittings. Total production between 1939 and 1946 amounted to 755 aircraft. While intended as a general purpose trainer aircraft, the Wirraway was used in combat against Japanese Zero fighters in the desperate defence of Malaya and New Guinea with terrible losses. Their principal contribution was as a trainer and in Army co-operation duties in New Guinea. Wirraways remained with the RAAF as advanced trainers until replaced by the CAC Winjeel in 1958. 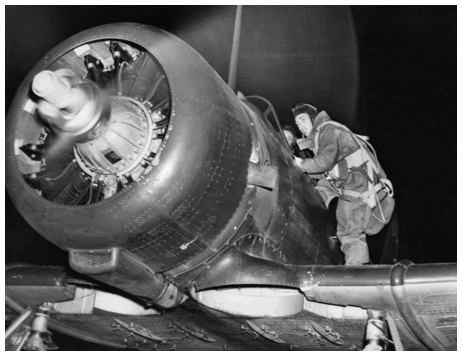 A dramatic picture of preparations for a night flight in a CA-1 Wirraway showing the single air intake for the oil cooler under the cowl. Note also that there is no air intake on the upper starboard side of the cowl (in the 10 o-clock position when viewed from ahead). The ribbed housing for the propeller reduction gears is also prominent on the Pratt & Whitney Wasp engine.Image copyright expired, courtesy of the AWM archive. The Wirraway is an Australian-built version of the North American Aviation NA-16-2K advanced trainer, the design of which was licensed from NAA for production in Australia. The Wirraway is a “cousin” to the well-known T-6 Texan trainer and the Harvard trainer, as all three aircraft were developed from the same “ancestor” – the NA-16 basic trainer which first flew in 1935. The Wirraway was built in 3 distinct versions (Mk I, Mk II and Mk III) and orders were placed in 7 different batches (contract numbers CA-1, 3, 5, 7, 8, 9 and 16). A total of 755 Wirraways were produced by Commonwealth Aircraft Corporation at Fisheman’s Bend in Melbourne, with deliveries between July 1939 and June 1946. CAC-built Pratt & Whitney Wasp R-1340 S1H1-G engine: The Wasp was the first engine produced by Pratt & Whitney Aircraft Co. following the establishment of the company in 1925. Fred Rentschler and George Mead left the Wright Aeronautical Corporation to form the company with Clayton Burt (President of Pratt & Whitney Company, a machine-tool company originally established in 1860). The first Wasp engine to be developed was fired into life on Christmas eve of 1925. It was a 9-cylinder air-cooled radial engine with a displacement of 1,340 in³ (hence the designation of R-1340) and it developed 425hp by it’s third test run. Many developments and versions of this basic engine followed, and the S1H1-G model which powers the Wirraway produces 600hp and features a 12:1 supercharger (the supercharger impeller spins at 12 times the crankshaft speed) and a 3:2 geared propeller drive shaft (the propeller spins slower than the engine – at 66.7% of the crankshaft speed). The Wirraway has a total of 18 “slips” below the wings from which bombs, pyrotechnics (flares) or supply containers can be dropped. On aircraft numbered A20-30 and higher the two inboard universal carriers (slips 1 and 2) are strengthened to carry 500 lb S.A.P. bombs, in which case the maximum bomb load is 1,000 lbs. 6 light series carriers on the centre section (3 per side, slips 5, 6, 7, 8, 9 and 10)Two tubes are mounted in the aft fuselage for launching 4-inch reconnaissance flares. The doors on the lower ends of the tubes are opened by control cables in the front cockpit. A Verey signal-flare pistol with 8 cartridges is carried in front cockpit. A Wirraway aircraft of No. 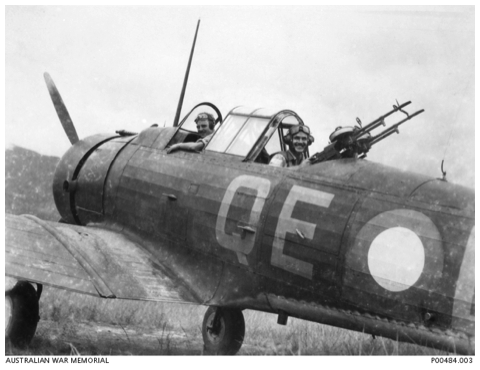 4 Squadron RAAF showing twin mounted Vickers gas operated guns made up in the Squadron. Identified are: 401866 Flying Officer John Maxwell Utber (Pilot); 431015 Flight Sergeant (Flt Sgt) Kenneth Davis (Observer). Flt Sgt Davis was killed in operations in New Guinea while serving with 100 Squadron, RAAF. Finally, Wirraway Order 150 (June 30, 1950) “Wirraway wing guns – electrical installation” was issued as well. The guns were mounted sideways under the wings on brackets held in place by 4 of the existing bomb steadies. The front of the gun was supported by a ring around the blast tube adapter (at the rear of the barrel) which was supported by a u-shaped bracket. This enabled the gun to pivot sideways and vertically for setting the convergence point. The rear of the guns was mounted with a single bolt through the mounting bracket which could be traversed inboard and outboard or adjusted vertically with the bolt threads. The wing-mounted guns were sighted with a Mark II reflector gun-sight, fitted according to Wirraway Order 134 – Reflector Sight Mk II Installation.